Bertha was once known as a dredger – a boat which was designed to keep channels clear for shipping by removing silt. I now understand that correctly she’s a drag boat in that she was like an underwater bulldozer which just shoved silt elsewhere. I saw her many years ago – in the 1970s I think – at the Exeter Maritime Museum which was a great place. And there she is – or at least was. She looks a bit unprepossessing but this little vessel has claims to fame. Let’s start with the motive power. This is a steam powered vessel but without screw or paddle wheel. She had a specific use in a specific location and she hauled herself along a chain which was anchored at some convenient point. Bertha would have been a dead loss in open waters for she had no method of propulsion other than the chain. And then there is the age. Bertha dates from 1844 and was built to keep Bridgwater Harbour clear of silt. 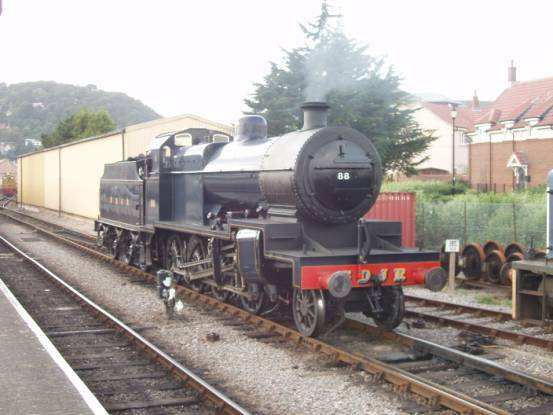 She was still operational when presented to the Exeter Museum in 1968. And then there is the question of the designer. This boat is attributed to Isambard Kingdom Brunel. Nobody is 100% certain but it is very, very similar to one he did design for use at Bristol docks. She is currently at Eyemouth – the other end of the country and out of the water. Actually, Eyemouth is in Scotland. All Brunel fans hope she’ll be returned to working order and will be seen in operation. Dungeness revisited, but not recently. This was back in 2003. I really am fascinated by the area. I’m not sure who regards it as pretty – but I do. It is an extending shingle area, much bigger now than when I first knew it because more shingle is deposited all the time. Eventually plants gain a foothold and the ground begins to stabilise. And what lovely plants they are. This is a place where small fishing boats get hauled up onto the shingle above the high water mark. A bonus for me is seeing the steam trains on the miniature (15 inch gauge) Romney, Hythe and Dymchurch Railway. This one is (I think) Black prince and behind it you can see the top of the 1960(ish) lighthouse which is now a long way from the sea. This loco is not a favourite for me. I prefer the ones that have a more UK look but on this day the next train suited me well. This is Typhoon and she has been on this line since 1927. She is gorgeous. By the way, these locos are just about one third the size of a full sized UK steamer. No wonder I love Dungeness. Gosh! It came as a surprise to me to find it was 23 years ago we went to the Isle of Man. It was 1993 so we took a couple of teenaged children there. And we spent time on railways! The Isle of Man is just a great place for railways with, at that time, half a dozen (roughly) different networks using three different types of motive power. But here we’ll concentrate on the steam railway. Once upon a time there was an extensive network heading from Douglas, the Island capital North, South and West. By 1993 only the line to the south was left and that had only just hung on by its finger tips. One imagines (or hopes) that these days the line is secure – mainly as a leisure trip for tourists like us. Actually, it was handy for us that there was a good rail network for we suffered a car breakdown and the need to import a part from the UK. We really didn’t suffer – except financially, of course. We got to Douglas from our camp site at Laxey and made our way to the quite grand railway station. Inside it really was stepping into a time warp. The stock on the line is decidedly heritage. At the head of our train was a smart little steamer. The journey from Douglas takes us south close tothe east coast. It is delightful scenery, hilly, verging on mountainous with some glimpses of the sea. At Ballasalla we passed the up train heading for Douglas. Then at Castletown we had reached the south coast and had a change of direction as we headed across to Port Erin on the west coast. The total distance is just over 15 miles. My final photo I have captioned as Port St Mary. I hope that’s right. 1993 was before digital days. You had to finish a film and send it off for processing before you saw your images. By then you may have forgotten the actual location. And 23 years on I can look and say ‘Isle of Man’ without a doubt, but just where, I couldn’t assert. But a lovely trip remembered. Kirkby Stephen is a small and pleasant market town in Cumbria but it may come as no surprise that I’ll not bother with that here. Instead I’ll visit the station which is on the wonderful Settle and Carlisle Railway. It’s best part a mile from the town and we had been there in November 2014 on a train. This time we were just checking up on train times for a possible trip into Carlisle. As soon as we arrived I spotted that something was up. There were people on both platforms that were clearly, to my well-honed eyes, rail enthusiasts. A couple of chaps stood at a platform end and near me there was a chap sitting with a classy camera, ready for action. I chatted to him and yes, a steam train was due to pass through. And there it was, passing through the bridge and about to pass the platform. The engine was working hard which meant there was a good show of steam. Now this was a long shot and I had plenty of time to be ready for a closer shot of the loco. The engine is number 45699. She’s a member of the Jubilee class and is called Galatea. The Jubilees were built by the London Midland and Scottish Railway, the first appearing in 1935 – the silver jubilee year of King George V. These locos would have found a home on this line so although not the most powerful express passenger engines I felt this one was very much at home on this special train duty. The train rounds the corner as it heads for Garsdale, Dent, Blea Moor and Ribblehead. There’ll be a lot of coal used on that climb. It’ll be hard work for the fireman. 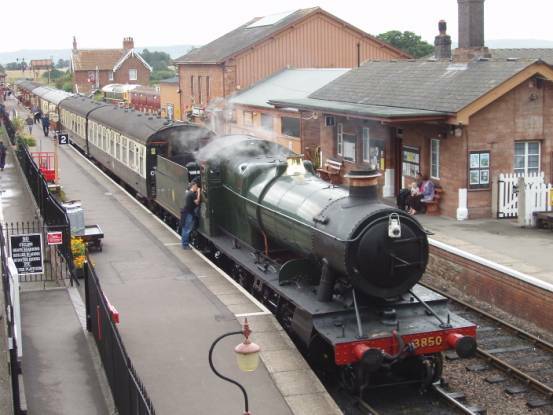 Back in 2003 we (that’s my wife and I) went to see and greet a train at Salisbury Station. The train was a steam hauled special, hauled by a loco which did a lot of main line specials back then. 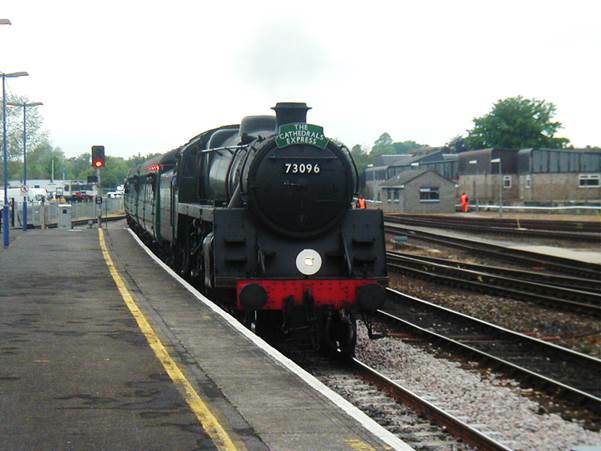 And here it is arriving at Salisbury Station. The train looks right to me. Actually, the loco never was a local engine in that part of the world but others of the same class were. And the train has a good rake of matching green coaches behind it. So although this is 40 years on from my train spotting days, the train looked just like some of the ones I used to see hauling trains out of London, Waterloo, to Basingstoke, Southampton and other places in the West. This train was special for me, not so much because of train or loco, but rather because we had an opportunity to meet some old school friends including my best friend from junior school days, a chap we all called Boz. I hadn’t seen Boz, probably for about thirty years then although I have seen him a few times since then and we always get on as though the intervening years (close on 60 of them) since we first met just didn’t matter. I couldn’t leave Salisbury without offering a rather miserable sight. This diesel would have been called a Brush type 4 in my train spotting days but at some point it became a class 47. It was around forty years old back in 2003 – about ten years younger than the heritage steamer. It really is in a rather sad condition with chipped and rusting paintwork and parked up amongst litter and detritus. I was told it had been taken off a train due to a flat tyre. Lest that sounds odd for something with a totally steel wheel, it does happen. If for any reason a loco skids, then a flat surface is worn on a steel tyre. A non-round wheel makes one heck of a racket and is damaging to track and loco. I can’t tell you if the loco had its wheels ground round again or if it was deemed not worthy of repair. 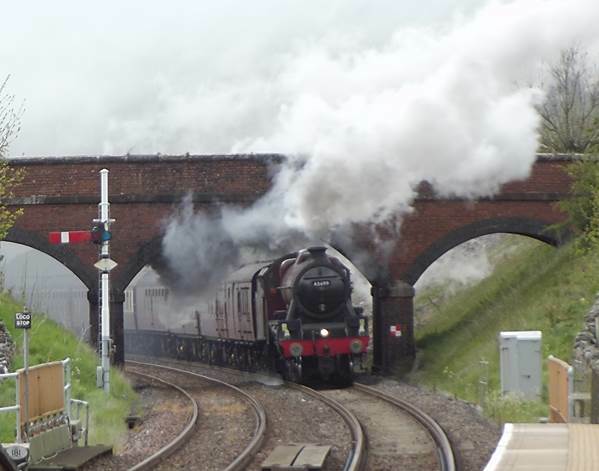 I do take the opportunity to see a steam train when one passes locally. Most recently, that was on December 2nd when a train taking a slightly devious route from London to Bristol passed through. When the train finally appeared it was exciting enough but the wait made me wonder why I did it. From the information I had I estimated the train should pass through where my local station once was at just about midday. I got there a bit early in case the train was ahead of schedule or in case other nerds got the limited spots available for a photo. By 12.35 when the train finally arrived I was frozen to the marrow. No other train had passed but I had enjoyed a fly past by ducks and also by a buzzard which was being harried by a crow. The train should have been nearly in Bath by the time it passed me. It was obviously going to be late! If the sun had been out I had a good enough position, but I got the wind wrong. The passing locos (yes, there were two of them) smothered me in steam. I expect that, as a teenage spotter I’d have made sure I saw the number on the second loco known as the train engine. The front loco in double heading is called the pilot. As it was, the train loco passed by in a haze of steam. Actually, it was very dramatic. Of course, I made sure I got photos. I got a long shot as the train came into view around the curve. It may look as though all that lovely steam will blow away from me, but the curve continues. I’m actually standing on the right side of that track as we can see as the train got closer. Now we can see that the steam from the pilot is drifting down over the side of the train engine and train. And seconds later that steam will engulf me as well. I’d better add that I am safely off railway property and behind a fence. The train itself was suited to the locos. They are ex London Midland and Scottish Railway engines and the coaches were in the maroon livery used on that line when I was a real train spotter. There was a Pullman car in the train formation. For the real train spotter the two locos were 44871 and 45407. 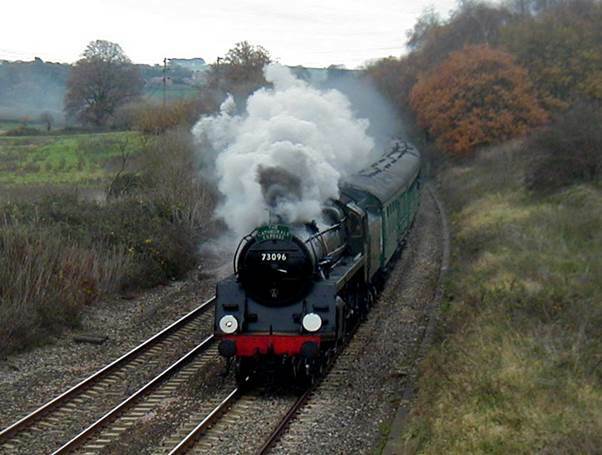 45407 carries a name as well – The Lancashire Fusilier. Neither came to my attention when I was a real train spotter! It’s a long time since I featured a ‘real’ steam train on this blog and I thought it was time for one. And here we have one redolent of my train spotting days but in fact dating from 27th November 2004. Gosh! That’s nearly ten years ago. I don’t know if it has become hard to get a path for a steam train on my local line. Ten years ago they were quite common. Now they are rare as hen’s teeth. I thought for a while one might be due through on 16th August, but a note said it would be diesel hauled near here. Anyway, here’s the train from back then in 2004. It’s passing through Cheverell. The loco looks to be working hard as she rounds the curves on the cut off line built in 1900 to give the old GWR a shorter route to the West. Now I have to confess that this particular loco was not known by me when I was a train spotter. I have no record of ever seeing her back in the 1960s and as far as I know she was based around Shrewsbury. But she was a British Railways standard class of engine and I saw identical locos and back in 2004 this loco was hauling the green train and that was the colour of my local trains back in the 60s. So in virtually every respect this train looks spot on to me. Dionysius Lardner was born in Ireland in 1793, became Professor of natural philosophy and astronomy at University College, London in 1828. He was a great populariser of science through lecture tours and books. 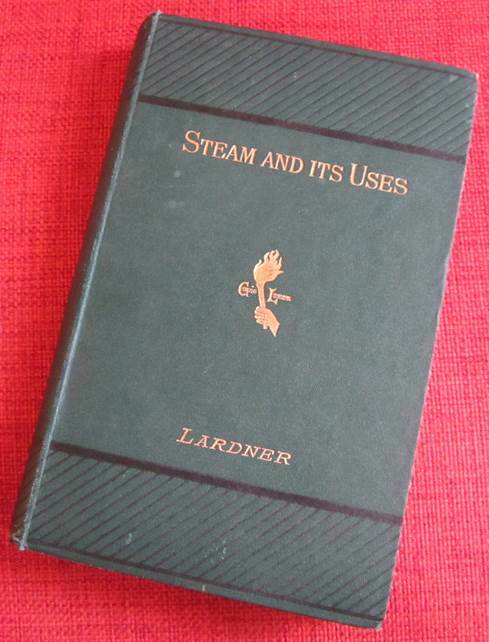 I am pleased to have a Lardner book although I find much of it hard to read. These early Victorians were obviously made of sterner stuff. 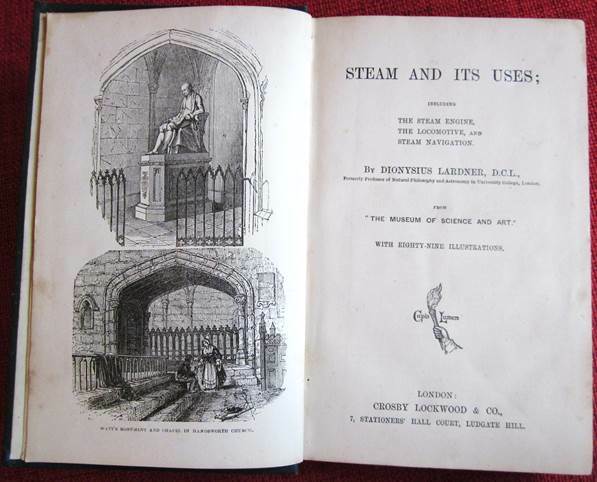 The book is called ‘Steam and its Uses’ and the reader is taken through the use of steam in stationary engines, railway locomotives and ships. There is no publication date in the book but Lardner is described as a former professor which dates the book to after 1840. 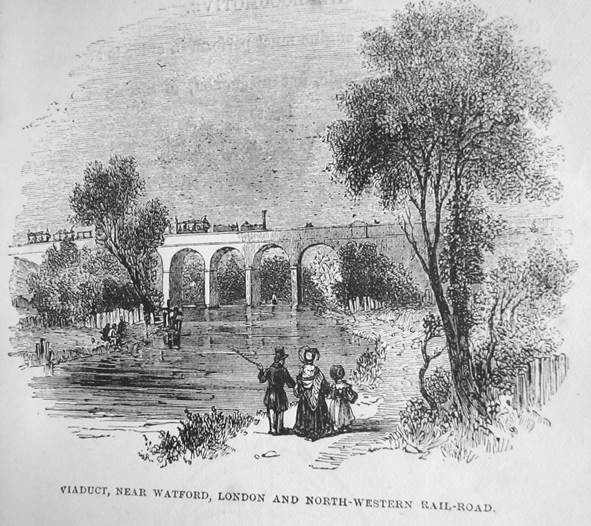 A railway illustration might help date as well. That looks a fairly early loco and train to me. The people have an 1840s style to them. Regarding Box Tunnel: If a train’s brakes were to fail in the tunnel, it would accelerate to over 120 mph (190 km/h), at which speed the train would breakup and kill the passengers. Brunel was able to point out that Lardner had forgotten friction and air resistance. Regarding Brunel’s Great Western Steamship: As the project of making the voyage directly from New York to Liverpool, it was perfectly chimerical, and they might as well talk of making the voyage from New York to the moon… 2,080 mi (3,350 km) miles is the longest run that a steamer could encounter – at the end of that distance she would require a relay of coals. Great Western made the Atlantic crossing with 200 tons of coal to spare. Sadly, it seems that an oft repeated quote attributed to Lardner is apocryphal. It seems this famous quote first saw the light of day in about 1980. 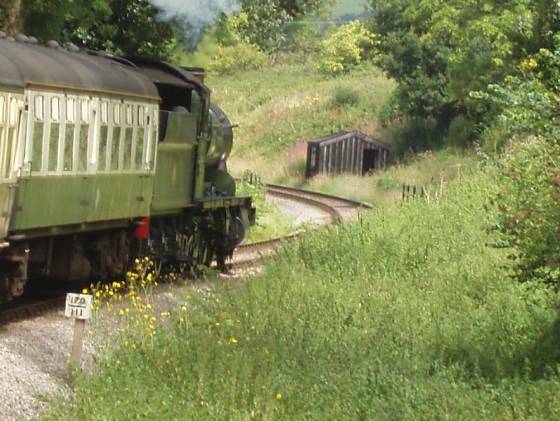 Back in 2008 we camped on Exmoor and took the opportunity to take a trip on the West Somerset Railway. At nearly 23 miles, this is a long heritage line. There’s a need for several trains in the summer. 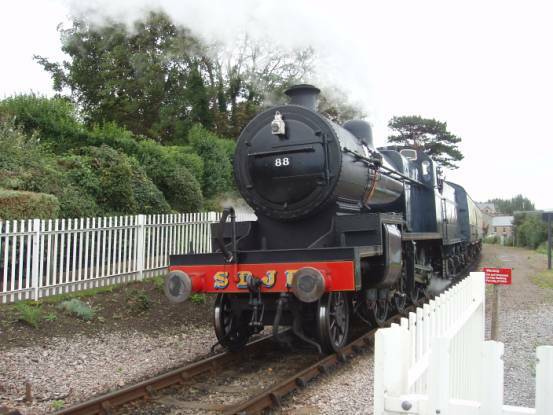 On our visit there were three different steam hauled trains and a diesel. We boarded at Dunster where we could park easily and enjoy a cup of tea made by the man in the ticket office. One of the disappointments of heritage lines is that tender engines have to run tender first in one direction. To enable them to run right way round hugely expensive turntables would be needed at each end of the line. So our train, when it arrived (which was spot on time) was to be a large GWR goods engine running backwards. The milepost shows we were 186 and a quarter miles from London. At Blue Anchor we passed the diesel train. I’m not in any way an expert on these diesel trains but it looks like a suburban set that might, in the early 1960s, have been used in and out of Paddington. At Williton we passed one of the other steam trains. Now for me that looks like a Western Region train of the 50s or early 60s. Wonderful! The engine is a 1927 design, but like most GWR engines its lineage can easily be traced back to the early 1900s. We passed the third steamer AT Crowcombe Heathfield. This one, running tender first, failed to get up the hill without a rest first. It’s another heavy freight engine, but this one was used on the Somerset and Dorset railway. 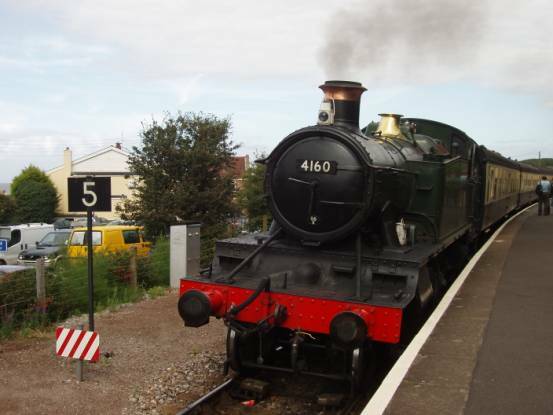 We arrived at Bishops Lydeard where our loco could run round the train for the return. Now it was facing the right way. 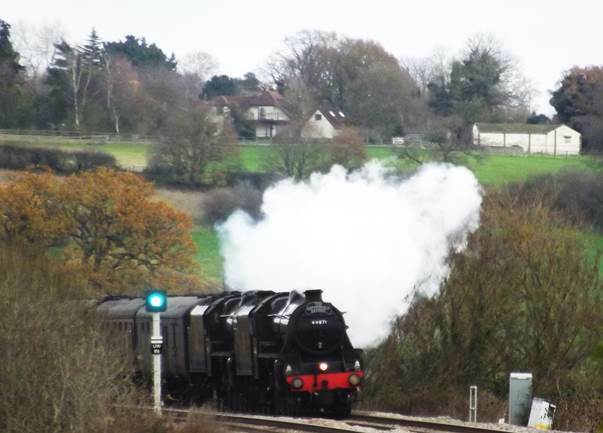 This photo was taken from the train as the loco worked hard up the hill and around the curves. 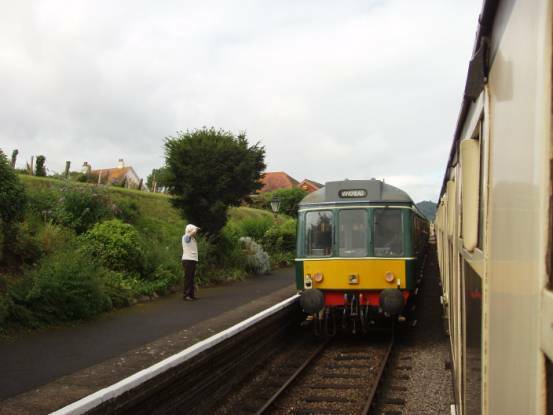 We alighted at Watchet where we saw the place and the old Somerset and Dorset loco heading for Bishops Lydeard. Our onward journey was with the lovely tank engine. 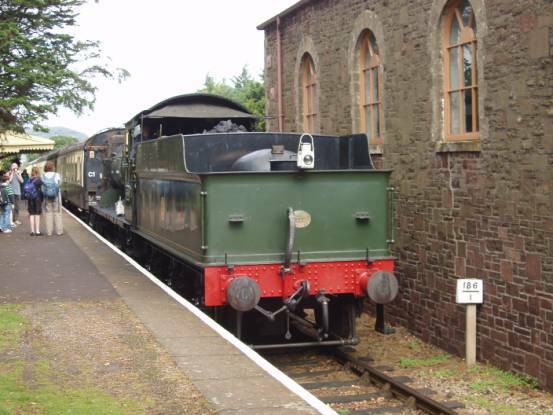 We took another break at Washford and then caught the diesel train through to Minehead. 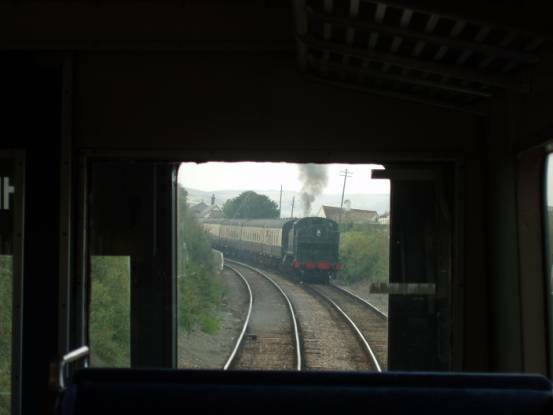 The great thing about these heritage diesel trains is that you could see out of the front of them. 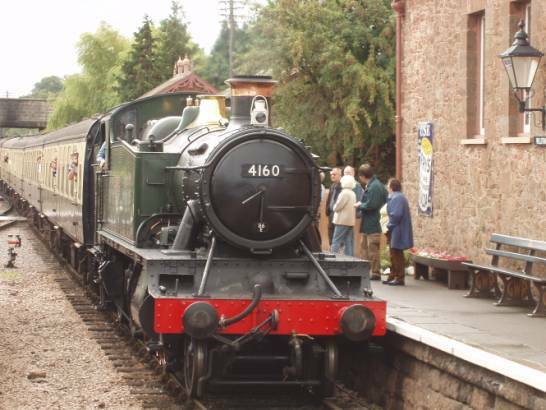 We had one more leg of the journey – back to Dunster and we got it right so we were pulled by the fourth engine, seen here running round the coaches. 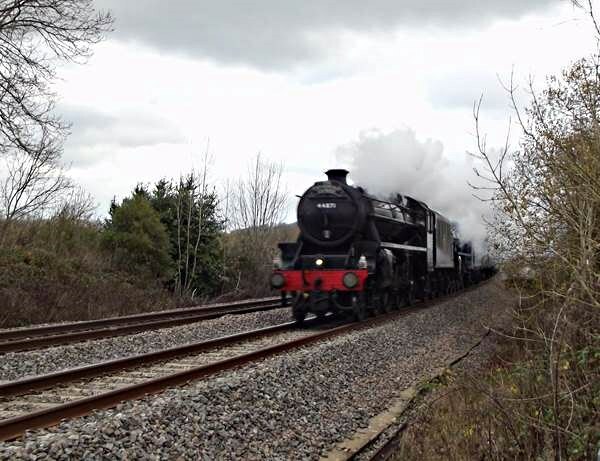 WSR – West Somerset Railway – was a very good experience. Honest, it wasn’t my idea that we went to the Kempton Steam Museum. It was brother-in law’s scheme and so, together with our ever loyal wives we made up a foursome. We’d better start with the ‘ticket’. This is a singularly large one because it doubles up as a clock card you can use in the original workers clocking in machine. So this is the ticket – all 30 cm long of it and it is double sided.The clocking in part took me back more than forty years to student days. Each year I got a summer holiday job and sometimes this meant using a clocking in card. Are such things still in use? I do not know. Obviously the ticket also has information – very useful information which can help you to make the most of the museum. 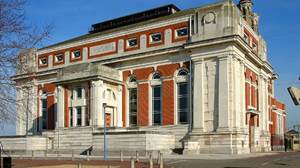 The engine hall is a beautiful building in its own right – for those that love the water works style, for this museum was a Metropolitan Water Board pumping station, sending water from Kempton in south west London to ‘The Northern Heights’ of London – places like Hampstead. It houses two simply enormous steam engines for doing the work and had space in the middle for a third which was never built. 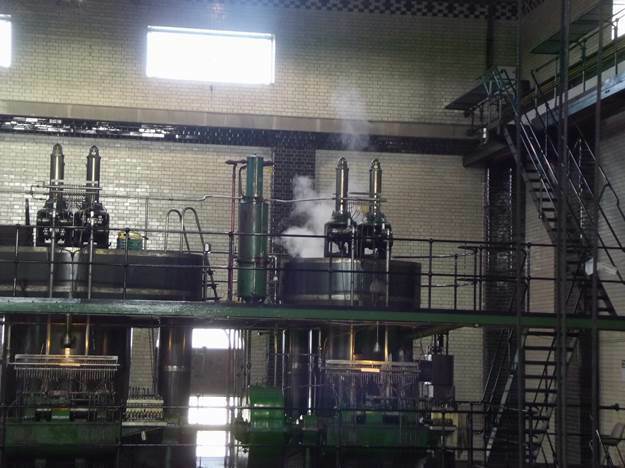 Technology changed and a couple of much smaller and more efficient steam turbine pumps were installed. With a quick look at the magnificent building, on a glorious November day, let’s take a look inside at the magnificent triple expansion steam engines. 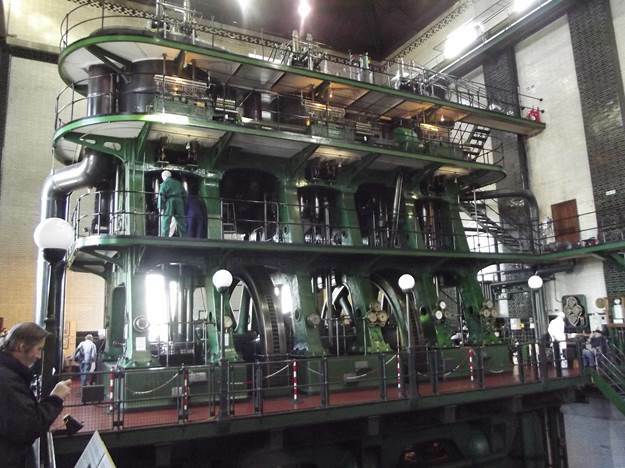 This is the working engine (not actually running at this instant) and the size of it can be gauged from the people. See that engineer with green overalls on the second tier? He really gives the place scale. And note, we can’t see the bottom of it in this shot. Apparently, the engines are more or less identical to the marine engines in the Titanic. When you see the size of them, you’d wonder how the ship ever floated at all with two such engines to power it. We gathered that, from time to time the engine hall is converted into the Titanic engine room for film sequences. Maybe that was what was going on today. 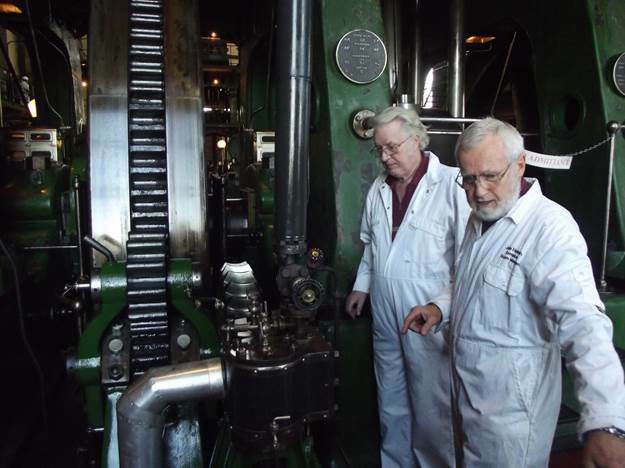 Here, a couple of white suited guides/engineers/were ready to set the auxiliary little engine into motion. The little engine can start the main one turning. It can’t start its self. 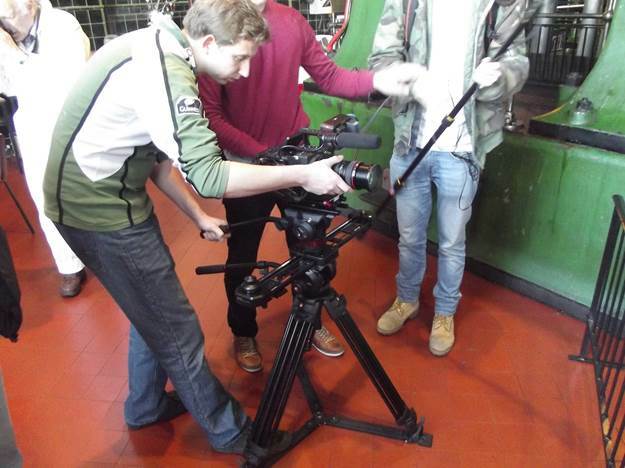 And a film crew were recording every action. 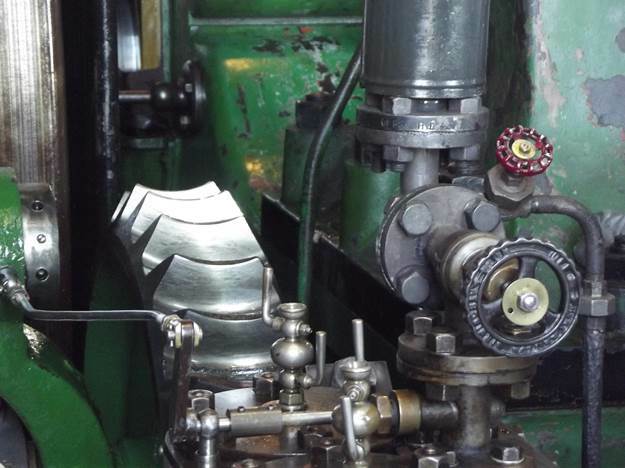 That wheel controlled steam flow to the small engine and once that was running smoothly the gears were engaged to start the big engine turning. You can click here to see a video of this happening. When the engine has been able to create a bit of a vacuum, the main engine can power itself and it runs freely and beautifully. You can click here to see the engine running. It was last used for its real water pumping purpose in 1980. But it turns again in preservation and the sights sounds and smells are all there. Look, there is even a puff of escaping steam. I will, no doubt, have further posts about this museum and a nerd’s day out.